"There's a freckle in my eye!?" That's usually the response to seeing a retinal photograph that contains a freckle or choroidal nevus (as it is formally called). With today's excellent imaging software, small freckles inside the ocular tissue are easier and easier to detect. So if you have a nevus, what does this freckle mean to you? 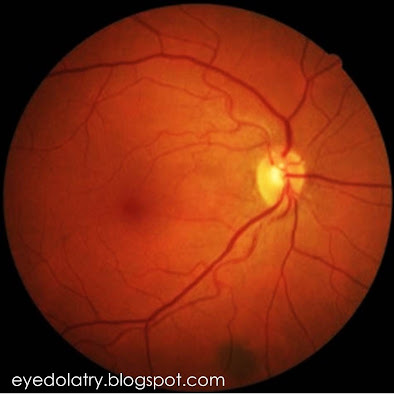 Normal, benign choroidal nevi occur in as much as 7.9% of the population (though with new technology we may find this incidence is a little higher since it is easier than ever to spot faint, small nevi). Melanoma inside the eye, conversely, are exceedingly rare, with only 6 in 1 million incidence rate. In neither a melanoma or a normal nevus will there be any visual effect (unless the melanoma is significantly advanced), so your doctor will only detect these lesions through dilation or retinal photography. Just like any freckle, the most important thing you can do is protect it from UV exposure. A normal freckle can turn into a malignant melanoma under certain conditions, and this malignant change has an incidence rate of 1 in over 8,000 freckles. While exceedingly rare based on these numbers, it is best to protect yourself. I always recommend sunglasses with 100% UV protection, but it is an absolute must for my patients with ocular nevi! Can you find all the nevi in this person's retinal photo? Hint (there are a total of 3). What do I look for in detecting suspicious freckles? Growth from year to year is a big risk factor, so I use retinal photographs to find any small changes in size or shape from year to year. A freckle that is 3 x larger than the optic nerve is highly suspicious. I also look for changes in thickness (if the blood vessels run over top of the freckle without changing their path, the freckle is flat! ), coloration, and position inside the eye. Freckles that are closer to the optic nerve are in a higher suspicion category. Your nerve is the eye's highway to the brain, so we don't want any malignant changes occurring so close to this pathway. 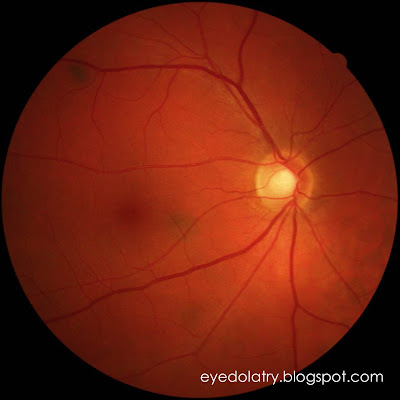 Always remember, most of the internal ocular findings that your doctor evaluates at your annual eye examination have no real consequence to vision, so you wouldn't know anything was changing inside your eye just by judging vision alone. Always best to get your eye evaluated regularly even if you don't need glasses or contact lenses! amazing click,nice blog.Thanks for sharing such e valuable info.